Looking for ‘The New Year’ gifts that you can give to your near and dear ones? This year, surprise your loved ones with beautiful machine embroidery projects. 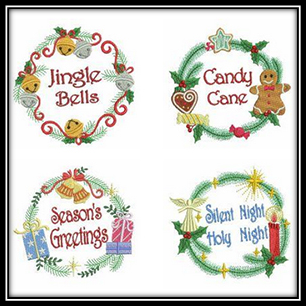 Take a look at the great range of Holiday season embroidery patterns that will get you in the spirit! New Year Kitchen Quilt set is digitized by designer “U&I Unique Embroidery.” This kitchen quilt requires a very small amount of machine sewing. It can be used on your table to go underneath a vase of flowers, a cup and saucer for an afternoon tea, or under a plate of cakes. It is a bit larger than a mug rug and has many uses. This quilt embroidery set is available in two different sizes – 8X8 inch and 7X7 inch. 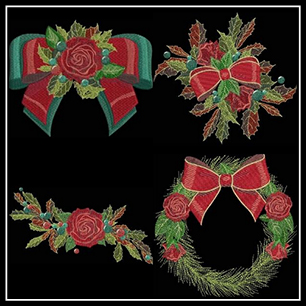 Christmas Elegant Outlines set is digitized by designer “Digidoodlez.” The applique edges of ‘Elegant Outlines’ have a rich new texture that makes the designs pop. You can dress them up with hot fix or peel and stick stones. You can also add ribbon and hang these as ornaments or scatter them around your tables as decorations. The star can be sewn with an upside down pocket, so you can hang it on the top of your Christmas tree. You can also use the star and wreath as coasters. These designs are available in the hoop size of 5X7. Holiday Sayings Blocks Set 2 is digitized by designer “Sewaz Designs. You’ll love these cute little blocks that celebrate major holidays and each have different holiday sayings on them. Get four holiday decors for one low price. This set consists of various embroidery designs including New Year, Easter, Memorial Day and 4th of July. This ‘holiday sayings’ set is available in the hoop size of 5X7. Christmas Book & Quilt set is digitized by designer “Heav’n Sent Creations.” This set includes 12 quilt square designs, 12 plain versions and 12 pages to make a story book for Christmas. You can also make a quilt to cuddle with, while you and your child read your new favorite book together. 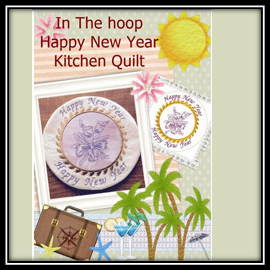 These book & quilt embroidery designs are available in the hoop size of 5X7. 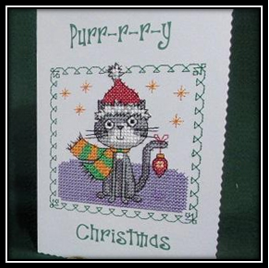 Christmas Cats Combo set is digitized by designer “Lickity Stitch Designs.” This set features four adorable Christmas cat cross stitch embroidery designs. 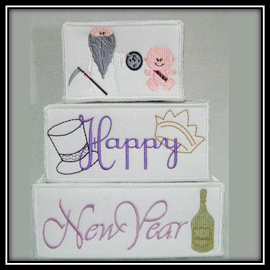 These embroidery designs are perfect for cards, or stitch as an ornament, coaster, gift tags, etc. These designs fit the hoop size of 4X4 and larger. You get several sizes and densities so you can use them on a variety of projects. It’s not too late to stitch up one of these quick, easy and totally adorable machine embroidery designs for the holiday season. For more designs, you can visit OPW Mall – where you are always #1. Now that the holidays are in full swing, it’s the perfect time to stitch up some special hostess gifts or projects to decorate your home or those of your friends or family. Here are 5 beautiful Christmas machine embroidery designs that you can use on home decoration projects. 1) Christmas Roses – Christmas Roses set is digitized by designer “KreationsBy Kara.” This set of 12 beautiful ‘Christmas Roses’ will add a traditional and gorgeous feel to your next project. Imagine an elegant quilt or a set of amazing place-mats. Maybe spruce up your tree with a fancy tree skirt. 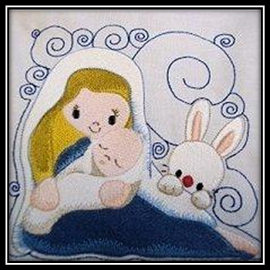 These Christmas embroidery designs are available in 4 different hoop sizes of 5X7, 6X8, 8X10, and 10X12. 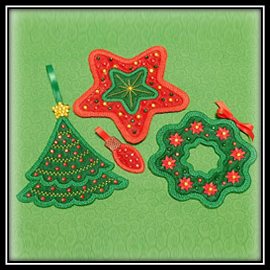 2) Christmas Wreath 2 – Christmas Wreath 2 set is digitized by designer “Sweet Heirloom Embroidery.” These wreath embroidery designs stitch up quickly on table runners, towels, or doily and are perfect for any Christmas project. These embroidery designs fit two hoop sizes – 4X4 and 5X5. 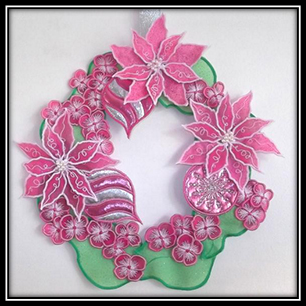 3) Christmas Wreath – Christmas Wreath set is digitized by designer “Enchanting Designs.” You can make a festive hoop of 3D organza Cerise pink Pointsettia and white Hydrangea flowers, with shiny silver and pink Baubles. It is equally as beautiful in traditional colors of red, Christmas green and gold. It is a lovely project to hang on the door for a warm welcome to your guests or create a festive, beautiful cushion with 3D flowers. This set includes a complete set of instructions and colored step-by-step photos to make it easier for you to understand. 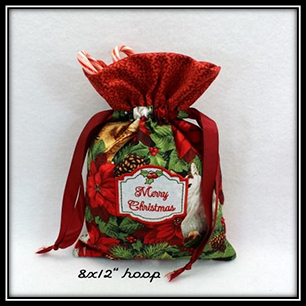 This wreath set is available in the hoop size of 5X7 and creates a 13 inch wreath. 4) Drawstring Bags – Drawstring Bags set is digitized by designer “Oma’s Place.” This drawstring bag is an eco-friendly way to wrap your gifts this Christmas or any time of the year, just change the fabric type and message on the bag. The bag comes with a Merry Christmas label, as well as a plain label and without label. The bag requires no hand sewing and is fully lined. Moreover, no raw seams visible, inside or out. Full instructions included. The Drawstring Bag embroidery designs are available in the hoop size of 8X12. 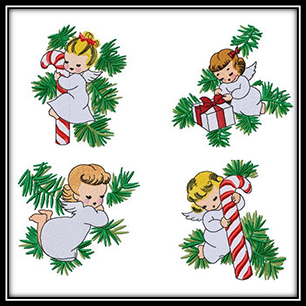 5) Christmas Angels Vintage – Christmas Angels Vintage set is digitized by designer “Carmella’s Korner.” This is an adorable set of vintage Christmas Angels digitized in two sizes to fit hoops from 4×4 to 5×7. These angel designs are perfect for your Christmas decorations for your home and create one of a kind gifts for your loved ones. What’s better than sewing Christmas decorations and gift projects? Giving them! Share this posts with your friends and enjoy the excitement and creativity you’ll spread. For more designs, visit OPW Mall – where you are always #1. Time is always a major obstacle for me. I keep so busy that there isn’t a lot of free time to fit in anything else. Urgent matters force me to give up other tasks or activities. Sometime, my wants take precedence. Like this week when I should be preparing for a yard sale. Instead, I took time to finish setting up my new sewing room. It is important that I have my embroidery machine available both for my own projects and to test the machine embroidery designs that I create. So, the machines are all in place, foot pedals matched to the correct one and power cords in place. Wouldn’t you just know it; I can’t find any of the tools and equipment that allows me to get designs into the embroidery machine! It looks like those items are still out in the garage in plastic bins that I haven’t gotten to yet because I was concentrating on the cardboard boxes. So, I took time from unpacking and organizing to set up the sewing room and didn’t have all of my equipment to begin with! What a waste of time for both sets of tasks. And, yet, all of my embroidery supplies are organized, so I can’t complain too much. I still haven’t found my smaller embroidery machine. I’d love nothing better than to tear the garage apart until it’s found, but that would be a time-waster when my first priority should be the yard sale. The garage is my staging area, so creating chaos in there will not help me. What if the machine should still be missing? I’ll waste time being upset about it instead of concentrating on the odds and ends I hope to sell in a few days. Like I said, time is a big thing in my life. Back in my corporate days, I had a boss constantly tell me to work smarter, not harder. Because my tasks took up every moment of every day, all of it beyond my control, it was truly a stupid sentiment from him. When it comes to my personal life, though, working smarter is something I very much can control. That is why machine embroidery is so important to me. It allows me to create beautiful items quickly, adding charm to my life in little ways. Doing it by hand may be more satisfying, but it would take too much time to get anything done. Harder or smarter? Utilizing machine embroidery designs is definitely smarter! I must say that walking into my newly organized sewing room does give me a thrill of joy and accomplishment, even if my main embroidery machine is nothing more than a large, white decorative piece. When I do find the missing equipment, it will be ready to go. I guess that’s still better than having everything on hand but not having it in order enough to use it. Either way, I think I deserve a trip to my favorite online embroidery design gallery. I just know there will be a great new free embroidery design there for me to reward myself with. I’ll worry about time later. Much later.